Three weeks ago, Pete Dunne retained his title at Takeover only to encounter Walter at the end of the show. Tonight, Walter is in action for the first time in an NXT UK ring. Good match. Melrose used his strength to get a rather surprising amount of offense on Mastiff. It was no clinic from Primate, but it was impressive and showed that he has potential to be more than someone who just makes other guys look good. Unfortunately for Melrose, he overestimated his strength, and that left him open for a quick and decisive comeback from Mastiff. A look at Xia Brookside (who will be competing next week). The first and only NXT UK tag champs, Zack Gibson and James Drake, head to the ring. Gibson says that while everyone else was trying to come up with cute team names, he and Drake were focused on becoming champs. That’s why they stand here today as tag champs. They crowd can do whatever they want, but they will call Gibson and Drake the Grizzled Young Veterans. Sid Scala comes out to the stage. He says that soon NXT UK will travel to Phoenix to show everyone why NXT UK is the best brand in the WWE. He also says that Johnny Saint has decided who will be Gibson and Drake’s first challengers for the tag titles: Oney Lorcan and Danny Burch. This was an extremely dominant debut for Walter. Jack Starz was a good first opponent. He is a lot smaller than Walter (so Walter can throw him around), and he is very pale (so we can clearly see the effects of each and every chop from Walter). Starz didn’t stand a chance, and the few strikes he got in just seemed to annoy Walter. I know Walter has his eyes on the WWE UK Title, but I feel like a match between Walter and the undefeated Dave Mastiff is inevitable. During the commercial break, Joe Coffey yelled at Walter as he passed by after his match. 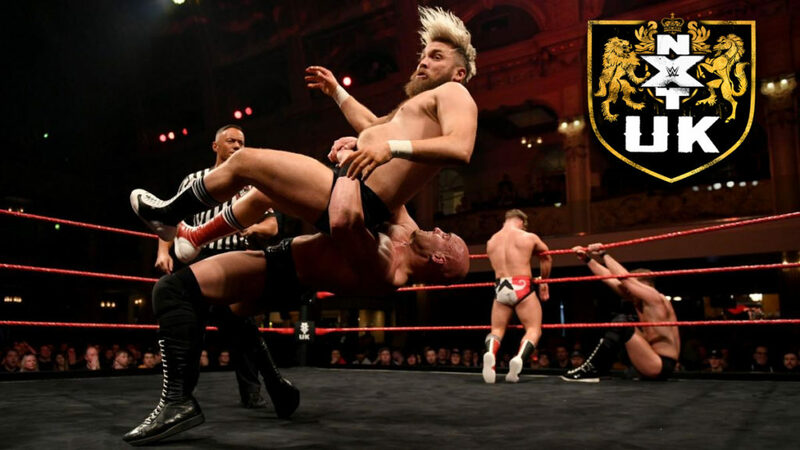 Marcel Barthel and Fabian Aichner walked up and told Walter that if he needed friends in NXT UK, then they would have his back. Walter just looked and them and walked away. Aichner seemed upset, but Barthel remained calm. Good match. This really put over the fact that Jinny will take every opportunity to hurt her opponent in any way possible. She was scratching, pinching, and kicking Owens while in holds and submissions. Owens did get a fair amount of offense, but the moves Jinny did were more powerful and effective (except for what Nigel called a double Achilles lock, that didn’t look painful at all). Earlier today, Rhea Ripley went to Johnny Saint and Sid Scala and demanded a rematch against Toni Storm. Johnny asks Rhea to step out of his office so he and Scala can discuss. Vic Joseph announces that the match has been made and will happen in three weeks on NXT UK. Great match. I didn’t really want to see either team lose this match. That said, I was happy with the finish. It made the most sense, and neither team looked bad. This was a fast-paced, exciting match as you might expect. Both teams are great, and they showed their greatness here. I would like to see this develop into a full-blown feud. This was a good show. A very solid main event topped off a night that had a debut and some nice character building matches. I hope they revisit this sometime in the future. I think the trio of Aichner, Barthel, and Walter versus British Strong Style would be fantastic.